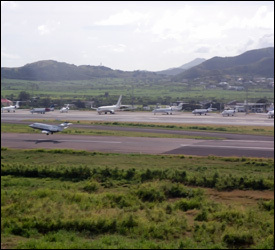 A date has been set for the groundbreaking of St. Kittsâ€™ private jet terminal. The ceremony to begin construction on this new world-class facility at St. Kittsâ€™ Robert L. Bradshaw International Airport is February 3rd and completion is scheduled for October 2012. The private jet terminal will be located west of the main airport parking apron and will consist of world class arrival and departure lounges, a business center, and related offices and processing facilities, as well as an elegantly landscaped courtyard and events center. The architect and interior decorator for the new terminal is internationally acclaimed Bobby Mukherji & Associates, recognized as one of Indiaâ€™s top ten design firms.